With our latest update, you are now able to see all of the information you need to create a conflict-free shift right inside your Shift Edit Window! Here at Humanity, we’ve recently made it one of our main priorities to focus on creating new features that are going to help all our clients avoid shift conflicts and find available employees to fill shifts as easily as possible. 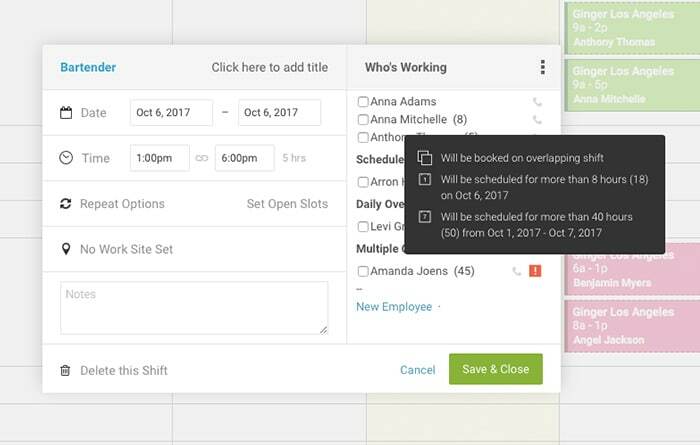 With our latest scheduling update, you are now able to see all of the information you need to create a conflict-free shift right inside your Shift Edit Window! Let’s get into how it works. Any time you click on a shift, you’re now going to see a lot of information right in your Shift Edit Window which should enable you to create a perfect, conflict-free shift very easily. You’ll see who’s working, who’s on call, who’s available, who’s scheduled to work today on top. After that basic information, you’ll see the conflicts (if any exist): overlapping shifts, overtime, minimum time between shifts, maximum working days in a row, availability, vacations and more. If the person who is currently scheduled to work the shift has a conflict, you can hover your mouse over their name to immediately see the conflict. If you need to give the shift to someone else, or you’d like to add another employee to that shift, you’ll see right away who is available to be added to the shift without creating another conflict. Further down, you will see all of the employees (who work the same position to which the shift is assigned) that can’t take this shift without creating a conflict. Every employee is listed under the conflict that would be created if he or she were to be assigned to the shift. The employees who are listed under “Multiple Conflicts” are the employees who are the absolute worst options when you’re trying to decide who is going to work the shift, simply because you will be creating not one but a number of conflicts if you decide to add them to the shift. You can hover over the warning signs next to the names of the employees listed under “Multiple Conflicts” and see a list of all the potential conflicts that would occur if they were to be added to the shift. Important: If you’re reading this with a confused look on your face because you don’t see any conflicts in your schedule, you might really have created an impeccable schedule! To make sure you do, go to Settings > ShiftPlanning > Advanced and disable “Do not initiate automatic conflicts on schedule” if you have this option enabled. Even though this isn’t a new feature, we’ve upgraded “On Call” a bit and it’s now very easy to see who is on call for a particular shift as soon as you open your Shift Edit Window. Now when you click on the phone icon next to a staff member’s name to designate them as “On Call” for the shift, they will be listed as such right about your Available employees for that shift and the phone icon next to their name will turn green. As always, keep the suggestions and requests for new features and improvements to existing ones coming! The best way to get involved is by signing up to our newly-opened Humanity Community and communicating directly with our product team and other Humanity users.